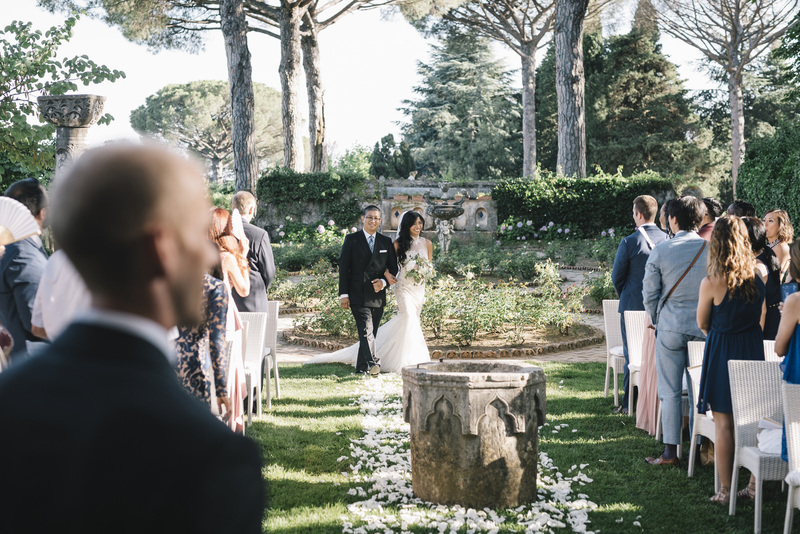 Alexis and Russel spent their first vacation together in Italy and from that first vacation this wonderful country has held a special place in their hearts. 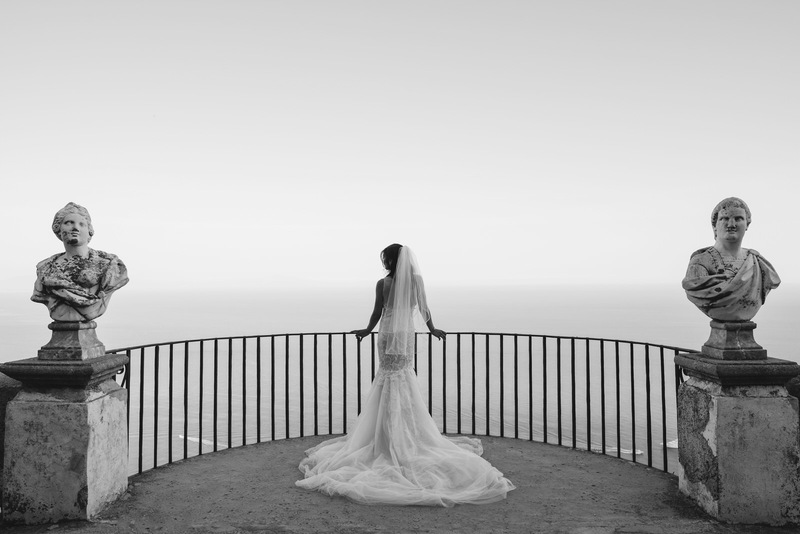 Four years later they returned and they decided to have their wedding with the backdrop of the Amalfi coast. 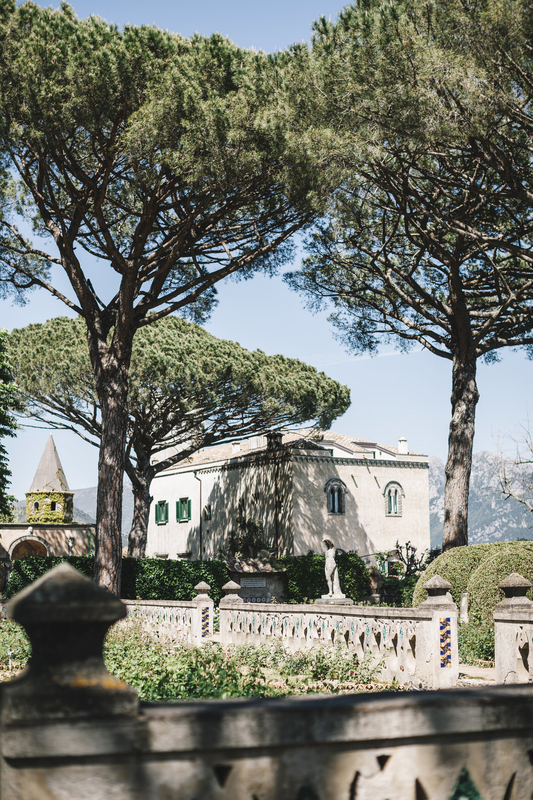 This is what the poet Boccaccio had to say about the area we call home. 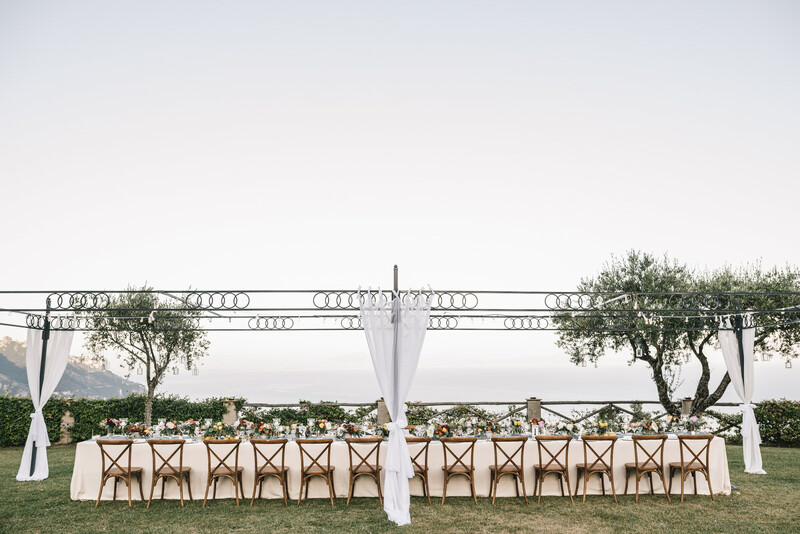 The coastal region is like a terrace overlooking the deep blue of the Mediterranean Sea. 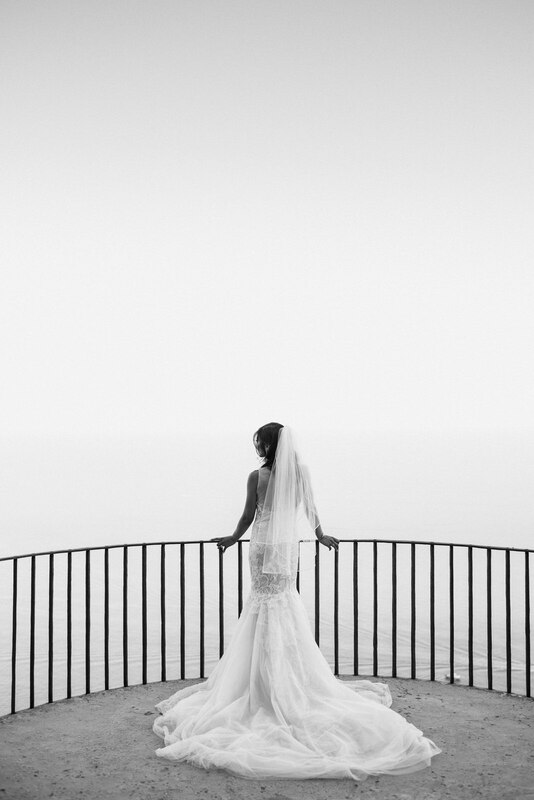 The Divine Coast, as it is sometimes known, descends steeply from the Lattari mountains, with the lively yellow of the lemon groves that dominate the hillsides, down to Scala and Tramonti ending with the blue of the sea that bathes the coastal towns of Amalfi, Atrani , Furore, Maiori, Minori, Praiano and Positano. 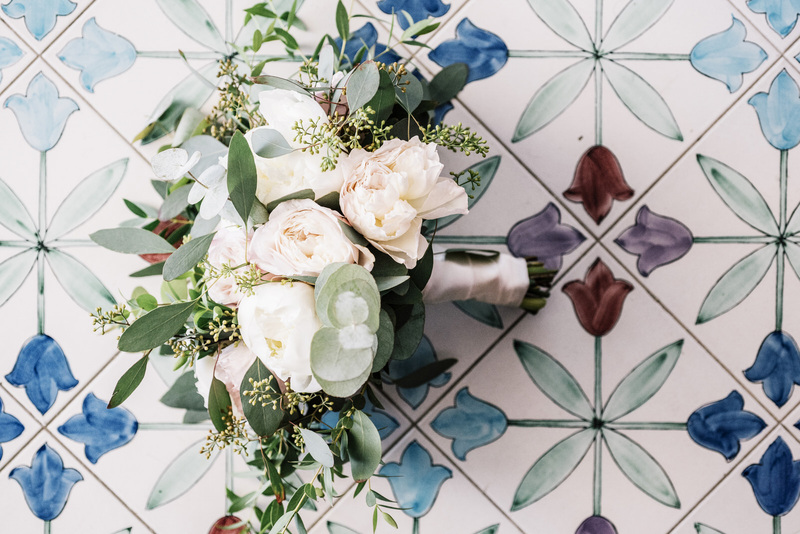 The latter town has a high backdrop, interspersed with rocky beaches and rocks that provide some of the most popular tourist destinations in the summer. 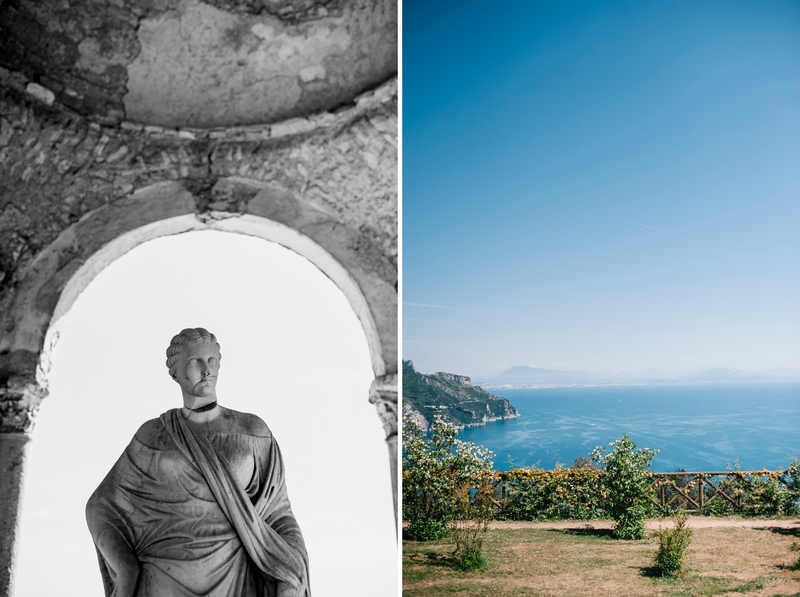 The Amalfi Coast is a riot of colour, a lively palette dominated by the bright yellow of the lemons, the intense blue of the sea that bathes the coasts, the green of the mountains, the shades of pink, white and peach that characterize the houses set among the rocks … a unique place in the world. 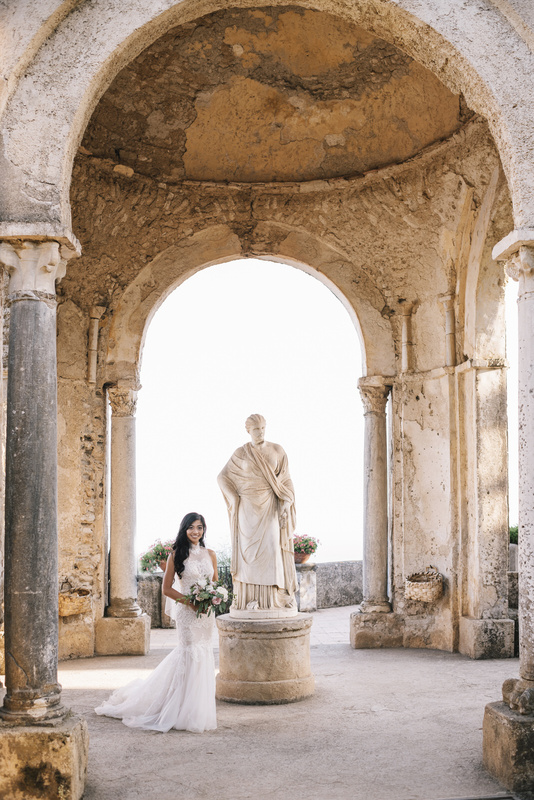 Alexis and Russel chose Ravello a pearl of the Amalfi Coast, where the sea coexists with nature, history with culture, the humility of silence with the pride of having attracted famous people, artists and writers who over time have given the town a special mystique. 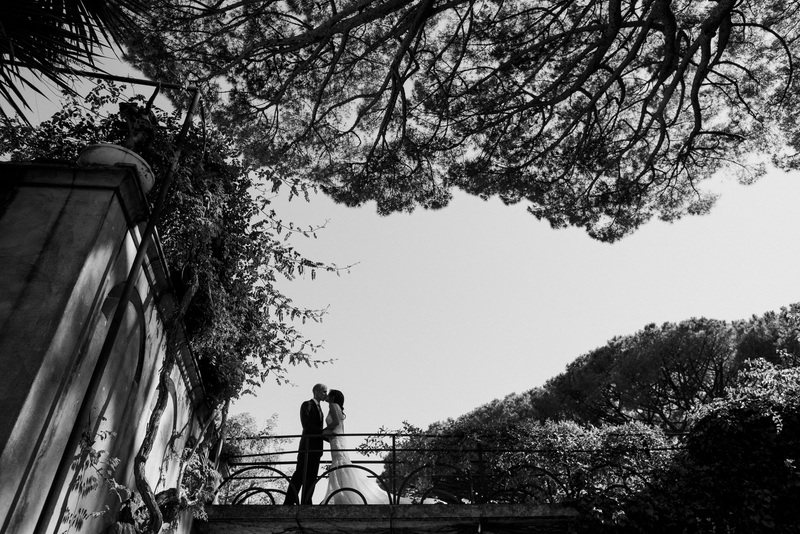 Above the town lies the wonderful, enchanting, charming Villa Cimbrone, the venue where they wanted to make their vows to each other. 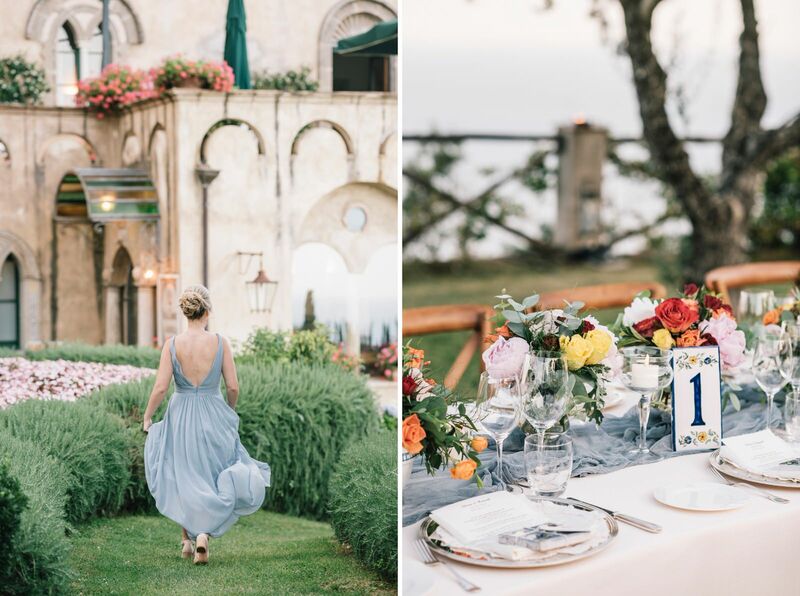 In this villa that rises above the sea, emblem of the incomparable coastal charm, with about seven hectares of parkland, you can breathe in deeply and sense the atmosphere of the Mediterranean. 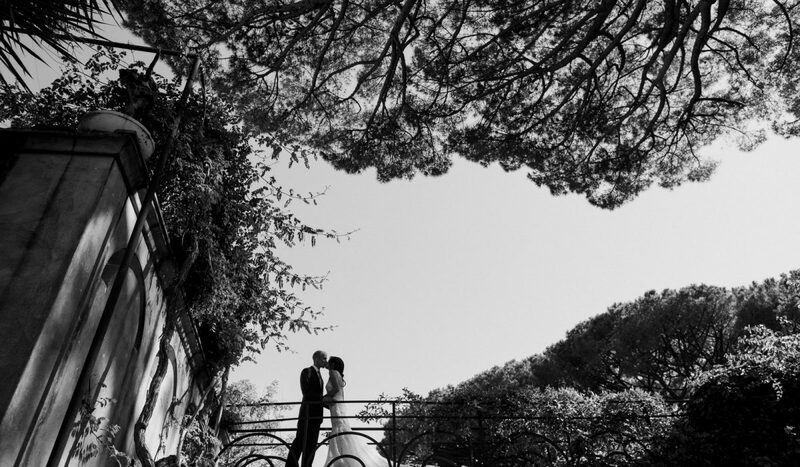 Stroll along the Viale dell’Immenso under a wisteria cinensis pergola, with huge clusters of hanging wisteria; take in the scent of the hydrangeas that sprout like coloured spots along rows of pines, plane trees and the rare 150-year-old Nolina “recurvata” where you come upon the magnificent Infinity Terrace from which to admire all the beauty of the Mediterranean landscape with patches of brooms that alternate with lemon groves. 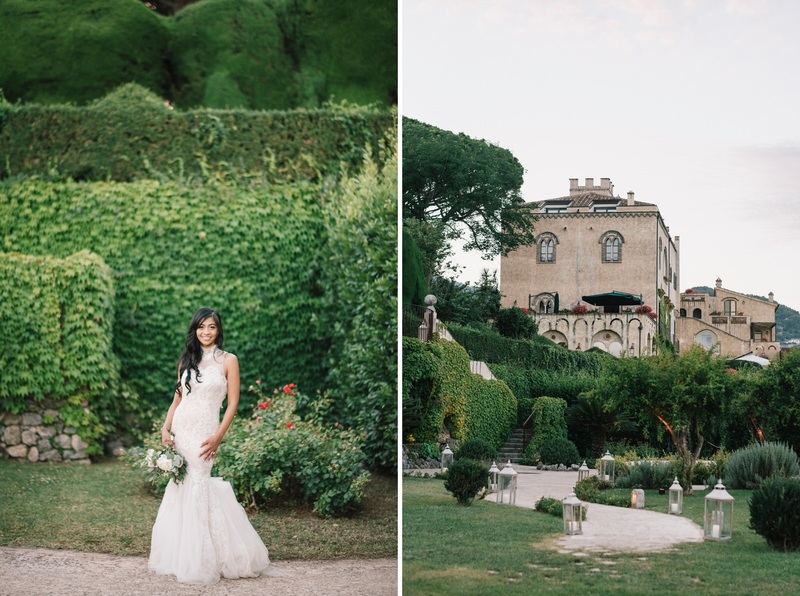 All this makes the Villa one of the most beautiful parks in Italy. 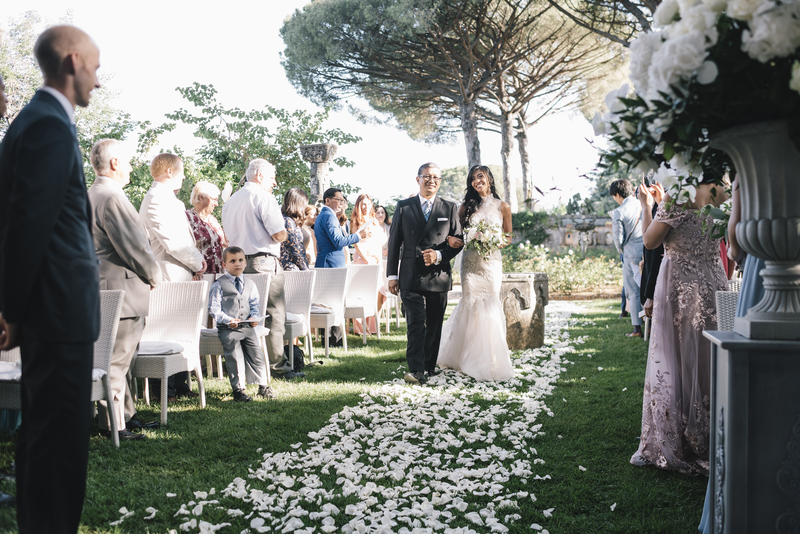 A portion of land also includes bright and exotic flowers, which give way to beds of multicoloured peonies, giant dahlias and roses. 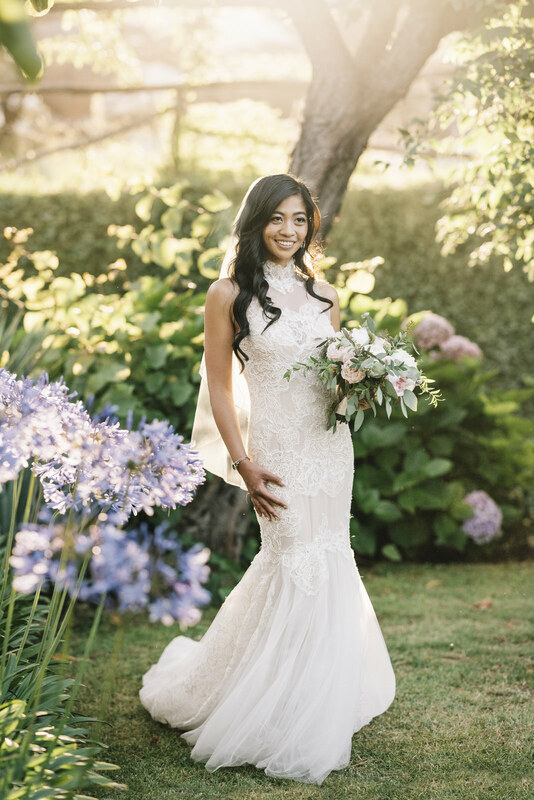 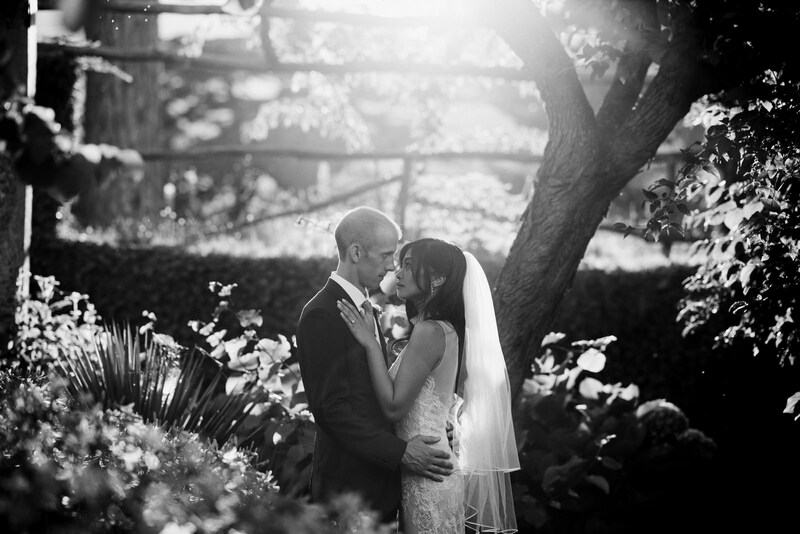 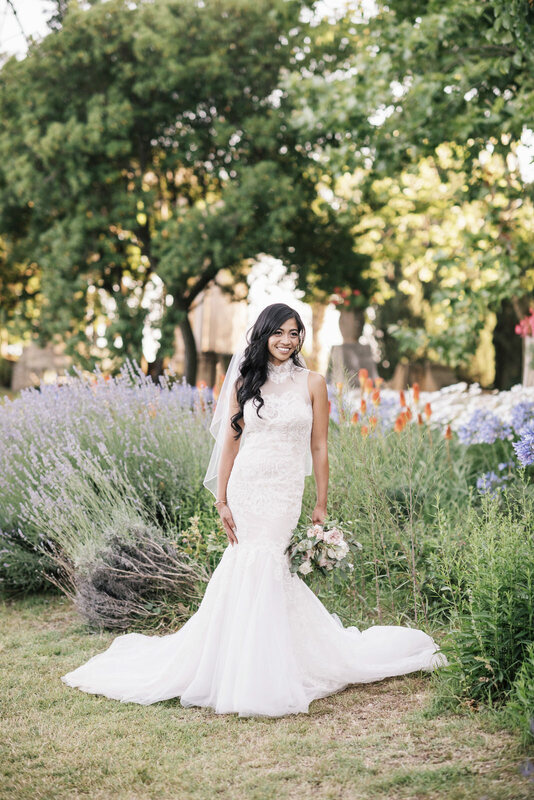 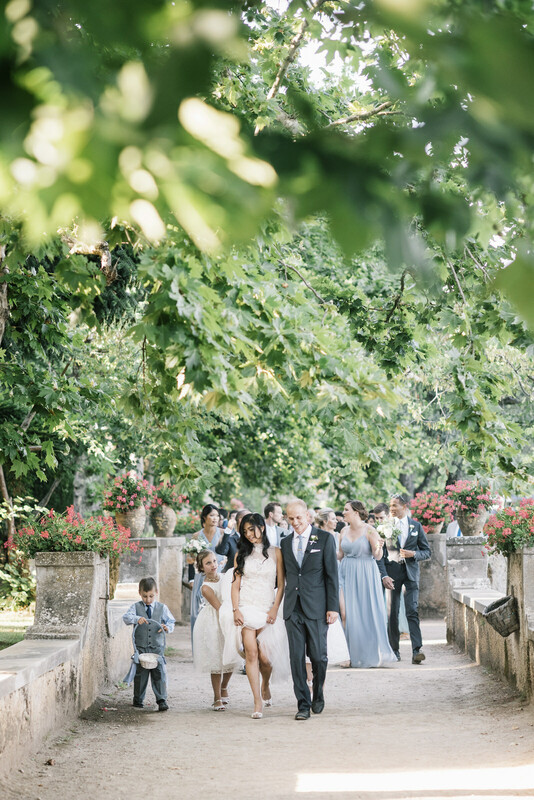 In this setting, embraced by of ancient trees, brightened by colourful flowers, intoxicated with the scent of lavender and wisteria, Alexis and Russel became husband and wife. 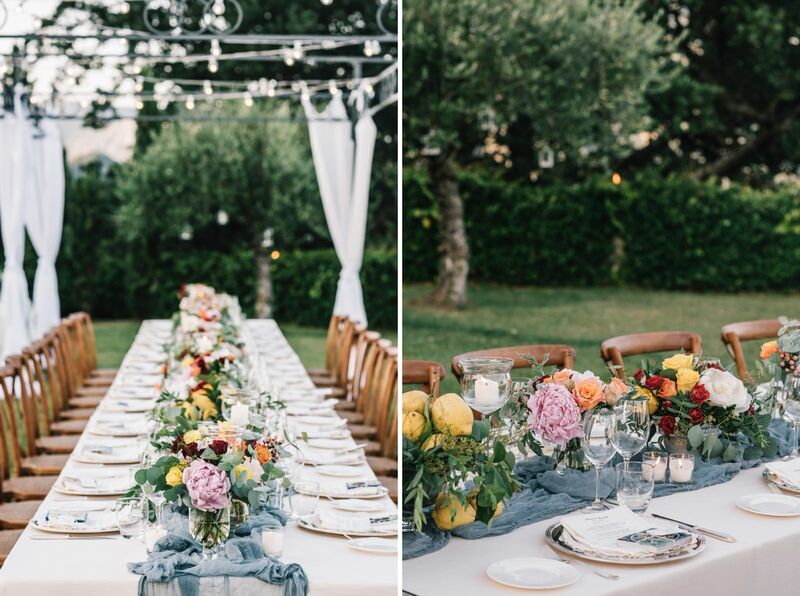 After the ritual that took place at the atmospheric Tea Room and the aperitif in the cool of the box hedges in the gardens of the villa, three imperial tables were prepared, inspired by the colours and the typically coastal style: with a soft central runner in natural blue sky fabric, low vases with dahlias, roses and hydrangea in shades of yellow, orange, red and pink, cups filled with lemons, place-setting tiles in typical Vietri ceramics, wooden chairs in walnut, small hanging light bulbs, all reflected the charm of the villa and its environs. 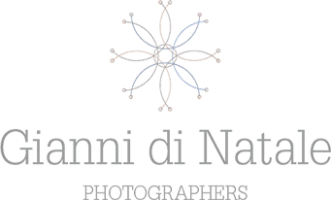 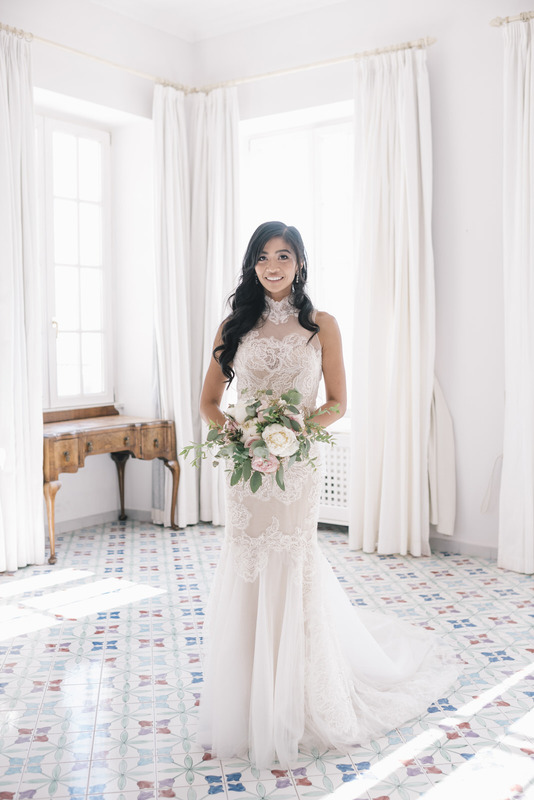 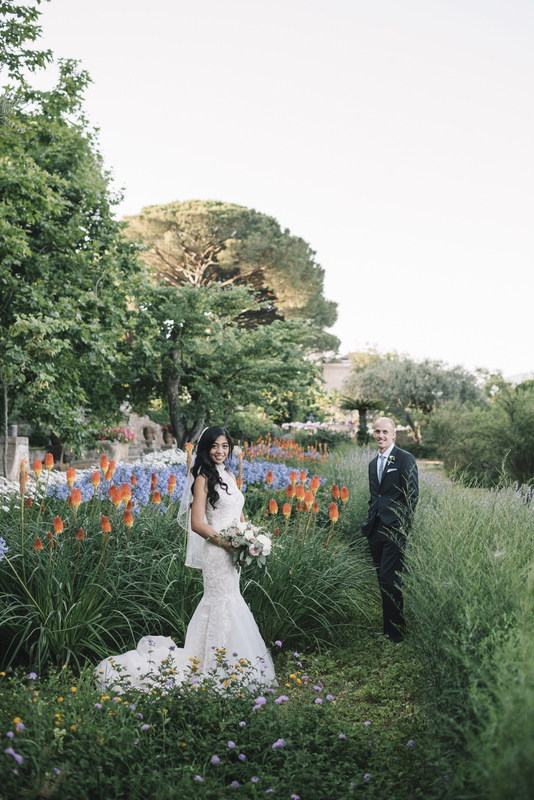 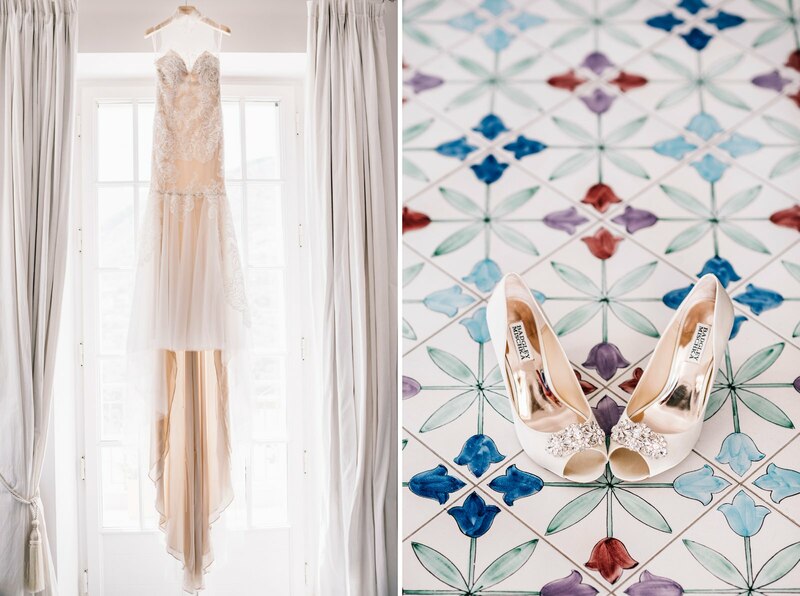 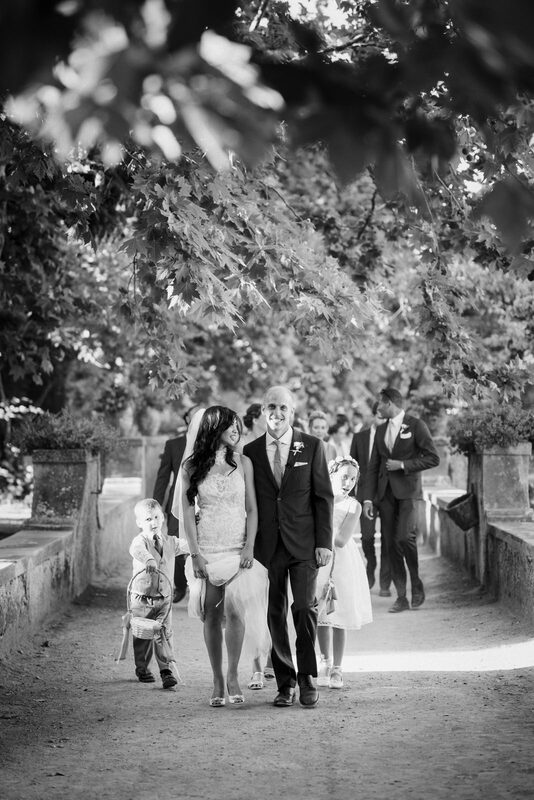 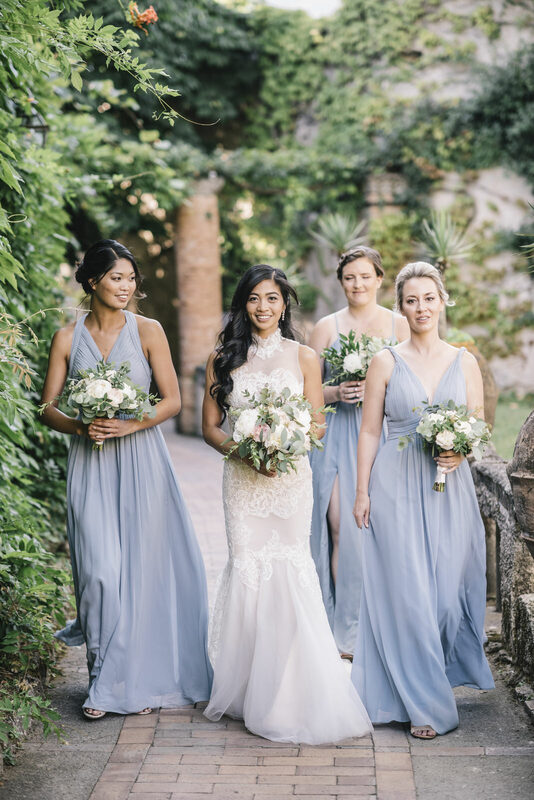 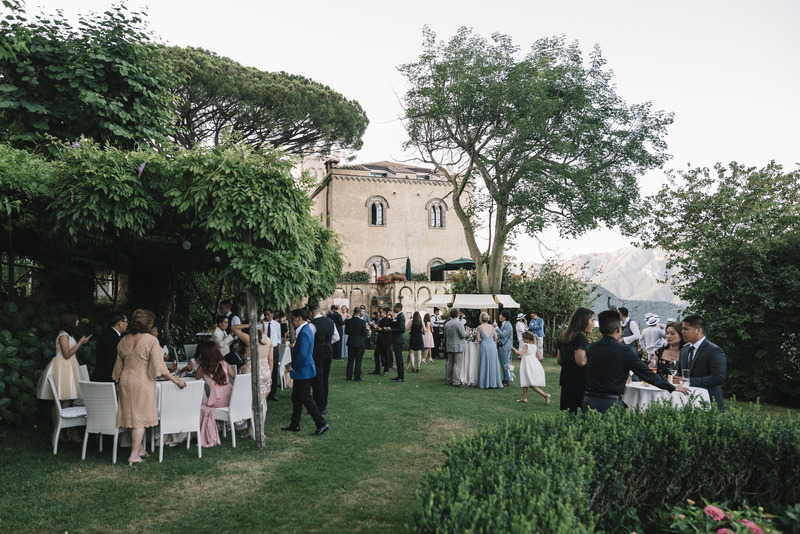 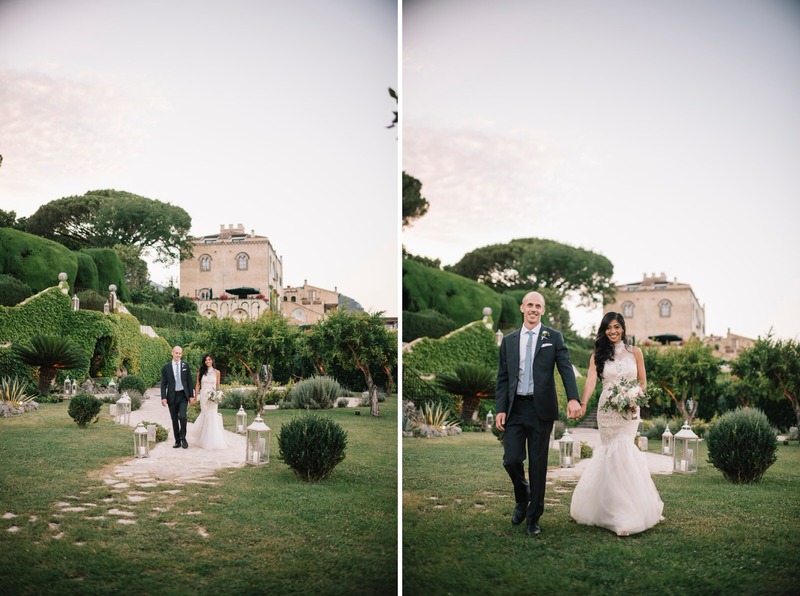 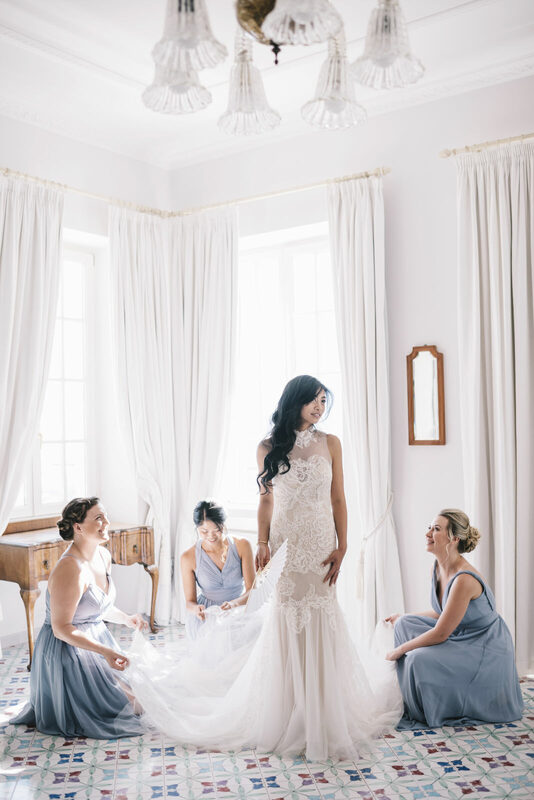 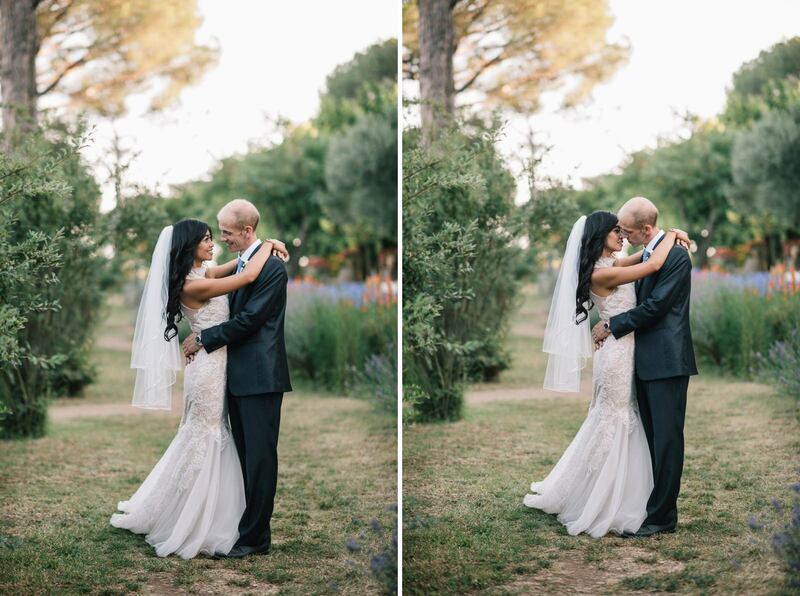 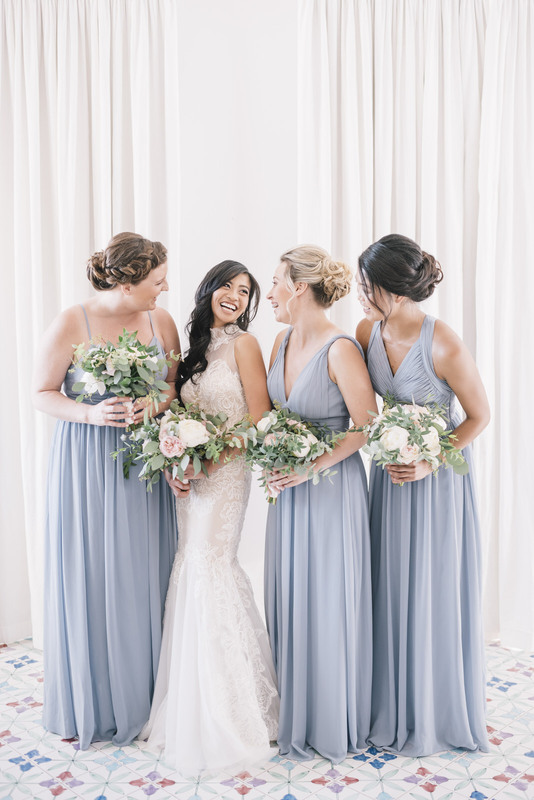 Did you enjoy this Amalfi Coast inspired wedding and do you want to see something more about getting married at the magnificent Villa Cimbrone? 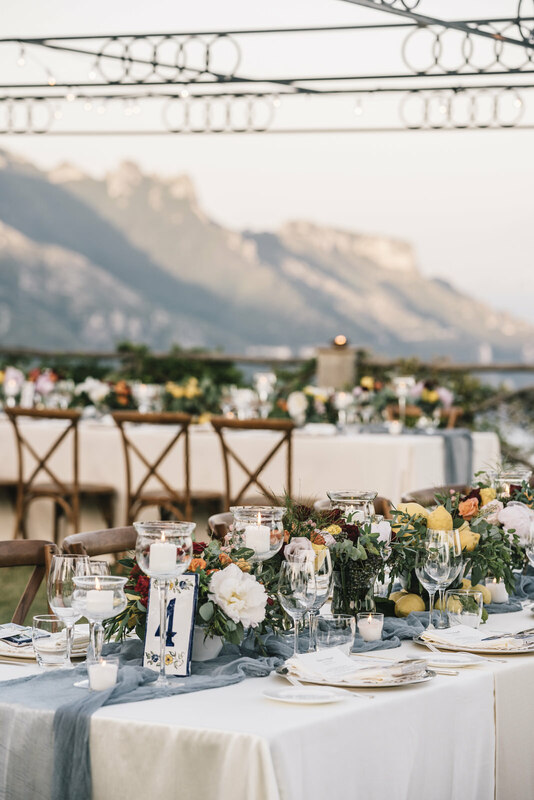 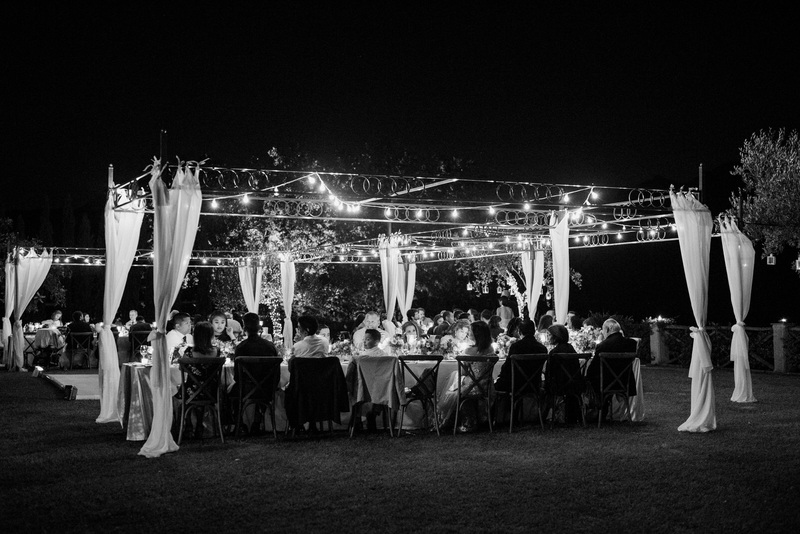 Do not miss our previous blog posts “A memorable wedding in Ravello, Alla & Scott” and “Romantic and luxury wedding in Ravello, Poppy & Louis” and let’s get in touch now!